Spice up your events and celebrations with personalized Instagram Frame. Order a custom Instagram Frame online at Dubaiprint.com at 131.25 AED now. One of the simplest ways to add a little more fun to an event or promotion is having an Instagram Frame printed. It is the best way to get into the hearts of fun-loving millennials. After the guests snap a quirky picture with the frame, they will post the image online, exposing your brand to many more potential customers. That is why besides being a beautiful prop, the frames are also an excellent interactive promotional tool. Instagram Frames are made from foam boards or eco-friendly D-Board. Both of the materials are light and durable, which means that you can use the frame many times and easily carry it from one location to another. Considering that Dubaiprint.com only produces prints of the highest quality, the frames will serve you for a long time. A custom Instagram Frame can have a wide range of applications - it can be used during business events, red carpets, and promotional campaigns. They are just as perfect for thematic parties, birthdays, weddings, and as they are for branding. Your guests, customers, and employees would happily use the frame to immortalize their fun memories and post the images on their Instagram, and Facebook pages afterward. Do not lose the opportunity - add hashtags that speak to your identity or brand, and spread your message. The custom Instagram Frame can either be delivered to your home or picked up from one of our locations for free. The Instagram Frame you order will be made from 10 mm foam board or eco-friendly D-board. The materials are both light and rigid. They will ensure that the frame is both easy to carry around and durable. The frame is going to be 100 cm in height and 70 cm in width. The prop has a cut-out center that is 50x50 cm for your guests to take fun pictures using it as a frame. All the other features of Instagram Frame can be customized based on your needs and wants. Use the profile information of your account or a business account of your choice, add cool hashtags, and decorate it however you like. If you like going to events and parties, then you know how much more fun can an Instagram Frame make it. They can spice up any gathering by turning it into something special. You can not only increase the recognition of your brand and gain potential clients with a custom Instagram Frame, but also make the event more entertaining. People like interesting and interactive items. It helps make their memories even more valuable. That is the main reason why Instagram Frames are so well-loved and popular. They help to capture beautiful moments and thus become the definition of a good time. Order the best Instagram Frame in Dubai, and make the events and parties a little happier for people around! 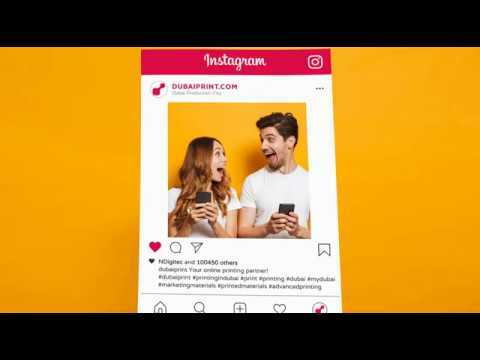 Why Should You Print Your Instagram Frame at Dubaiprint.com? ✔ Quality control: we always make sure that our products are executed without flaws. For that reason, we even have a special team in place that double checks all of the prints before sending them out. ✔ Brilliant printing quality: producing high-quality prints is what we specialize in it. That is why we make sure that we are using the best technology in the market, and offering the best-quality prints. ✔ 100% guarantee of satisfaction: the positive experience our customers are having with the brand and their loyalty is a merit of success for us. That is why we want to be sure that you are coming away from us feeling like you have made a great choice. ✔ Cost-effective solutions: it is vital for us to match the quality of our prints to their prices. We want to offer the best services for the prices that do not empty your bank account. Do you have any questions about our printing? Or maybe you would like to learn more about us? Then contact our support team right now. Call us at +97144514554 or send us an email at support@dubaiprint.com. At Dubaiprint.com we are always happy to hear from you!